TULARE COUNTY – The trip up Rocky Hill Drive east of Exeter is a scenic view of Tulare County’s straight rows of farmland with canals snaking across the rural landscape. The steep grade of the hillside is also a training ground for cyclists and runners challenging themselves to the summit and back. Its beauty and bravado is breathtaking but it can also be dangerous. Cars have injured cyclists. Cyclists have injured pedestrians. And some have even died. 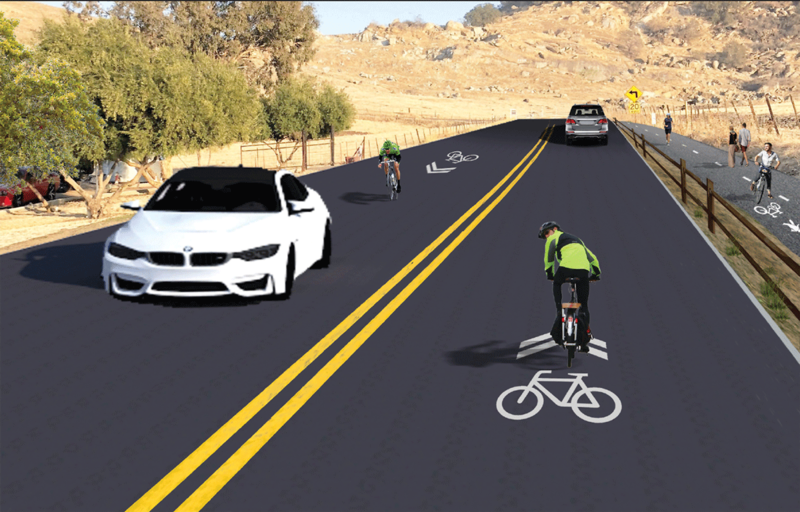 In an effort to make the roadway as safe as it is serene, the County of Tulare is proposing to widen the roadway to make room for pedestrians and casual cyclists separated from the traffic of serious cyclists and passing motorists. The first step toward that goal came on March 19, when 4-Creeks, Inc. presented a feasibility study on a plan to create pedestrian/bike lanes on 3.35 miles of Rocky Hill Drive between Spruce Road (Road 204) and Yokohl Valley Drive. Design Option 1, the preferred option for cyclists and motorists, would create a 39-foot right-of-way that would include (from hill to hillside) a 8-foot wide, two-lane Class I bike/ped path and a 20-foot, two-lane roadway shared by bicycles and cars, also known as a Class III bikeway, separated by a five-foot buffer with a fence. The Class I paths will be used by casual cyclists and pedestrians while the Class III will be reserved for experienced riders more comfortable sharing the road with cars than people. The cost is an estimated $3.1 million. Design Option 2, including 5-foot Class I bike paths on both sides of a 20-foot wide, two-lane roadway as well as a Class I bike/ped path separated from the road and adjoining bikeway by a 3-foot buffer and fence would have required an additional 4 feet of right-of-way. The cost is an estimated $3.3 million. Annual maintenance on both projects would cost between $14,500 and $19,200. 4 Creeks held four outreach meetings in Exeter and Visalia to help narrow the design of the project. At the first two meetings held last August, attendees were surveyed about how often they use Rocky Hill Drive, what they use it for, and what kinds of improvements they would like to see. Three-quarters (77%) of those surveyed said they used the road (driving, walking, or cycling) at least once per month, 42% used it at least once per week, and 6% used it daily. More than half (51%) said they used the road both weekdays and on the weekend. Just under half (47%) said they used the road for health and exercise and over a third (34%) said they used it for recreation. Nearly two-thirds of respondants (63%) said they would like to see Rocky Hill Drive become a two-lane road and 19% said they would like a two-lane road with an adjacent trail. Sixty-two percent wanted public parking, 43% wanted washroom facilities, and 40% said they would like to see benches. At a final public outreach meeting on Jan. 16, 2019 at Exeter City Hall, attendees selected Option 1 because Option 2 would put cyclists on the edge of the road and a scenic outlook, which could potentially attract illicit activity. Supervisor Kuyler Crocker, who represents District 1 encompassing the Exeter area, said the area was a great natural asset for the county to highlight but said the project was needed to improve safety. Rocky Hill Drive is a well-known running and cycling route for local residents. The road is also used for recreational events, such as the annual “Hell of a Half Marathon” in Augusts and “Rocky Hill Triathlon” in April. While Rocky Hill Drive has some signage to direct pedestrian users, there are no marked sidewalks, crosswalks, or other pedestrian/cyclist infrastructure. That’s concerning considering there are about 600 cars traveling on the road each day. Between 2013 and 2017, 13 accident happened on Rock Hill Drive, according to the California Highway Patrol. Improper turns and unsafe speeds were listed are the most common cause of collision during the four-year study period. Collisions with stationary objects were identified as the most common type of collision. The first right turn along Rocky Hill Drive, coming from Yokohl Drive, was the most common collision location, followed by the intersection of Road 204 / Spruce Ave and Rocky Hill Drive. In 2011, Scott Nelson, a 41-year-old math teacher from Visalia, was cycling with a colleague downhill when a runner, a 14-year-old Exeter teen, unexpectedly turned into the path of the Nelson’s bike. The impact threw Nelson from his bicycle and into the asphalt. Nelson died at the scene. He was wearing a helmet according to CHP. The 14-year-old runner was taken to Kaweah Delta Medical Center with minor injuries. The tragic death of Nelson has served as a stark reminder that walkers, runners and cyclists must share the road and follow the rules of the road. California Vehicle Code requires that walkers and runners must stay close to the left edge (facing oncoming traffic) of the roadway where there is not a sidewalk unless other conditions would compromise the pedestrian’s safety. Cyclists must follow the same rules as cars and trucks (flowing with traffic) as bicycles are considered a motorized vehicle. While the project will include cattle crossings between the north and south sides of Rocky Hill Drive, agricultural property owners say cyclists and pedestrians are not respectful of agricultural uses on Rocky Hill. Parking cars along the roadway restricts tractor farming operations, fertilizer and pesticide spraying while people are present causing health and liability issues. Farmers and ranchers also said there was a need for parking and restroom facilities in order to prevent them from using private property as a public bathroom. The plan recommended that all proposed parking and restroom facilities be provided off-site. Restroom facilities and additional parking may be developed at the south-east corner of Spruce Avenue and Rocky Hill Drive. According to 4 Creeks, the property owner intends to develop the site with neighborhoods serving commercial services, and is interested in making an agreement with the County to include public parking and restroom facilities in that development. Linda Gill, who owns land along the largest stretch of the road’s southern side, said she was glad to see the lookout would probably not be part of the project. She said the hillside after dark has had problems with robberies and knife point and gun point. She warned that any designated parking area may also become an easy spot for robbers to prey on those walking the hill. “A lookout sounds nice until the sun goes down,” she told the supervisors. The majority of the land along Rocky Hill Drive is privately owned, with grazing and ranch land as its primary use. Private property has been developed on both sides of Rocky Hill Road; single family homes can be found on the north and south side of the road. The eastern half mile of Rocky Hill Drive also cuts through citrus orchards and intersects the Friant-Kern Canal. The Gill family owns two other large parcels on the south side of the road to the western edge near the canal and the eastern edge near Yokohl Valley Drive. Between the Gill properties is primarily owned by Albert Moore. Most of the land north of the roadway and east of the canal is owned by the Badger Hill Association, the homeowners who live atop the adjacent Badger Hill. In order to protect her cattle, land, and home, Gill requested cyclone fencing to keep trespassers off her property rather than the decorative fencing proposed for separating pedestrians from traffic on the road. “Pedestrians on Rocky Hill use private property as they please,” Gill said. There are some other considerations as well, including cultural and wildlife concerns. Prior to European missionaries and settlers, the Foothill Yokuts, a subgroup of California’s great Yokuts nation, settled around Rocky Hill and considered the hill a traditional spiritual site. Many of the prehistoric sites of the Yokuts and Western Mono tribes have been lost, either ruined by time, usage, vandalism, or neglect. Only a few of these sites still exist as dispersed rocks, cupules, grinding holes, pecked and painted drawings on boulders, and some potentially uncovered artifacts. There are sites still stand that continue to be used by descendants of Tulare County’s first residents. While many of the sites that are known are all hidden from the public in efforts to protect them, there are still a few sites that are accessible through the Archaeological Conservancy – such as Rocky Hill. The area currently features seven sites with pictograph paintings, bedrock mortars, slicks and cupules created by the native Yokuts tribes in the last 2,000 years. The biggest wildlife consideration is the San Joaquin Kit Fox, which has had five sightings within five miles of Rocky Hill. The diminutive fox is on the federal endangered species list and the California threatened species list.